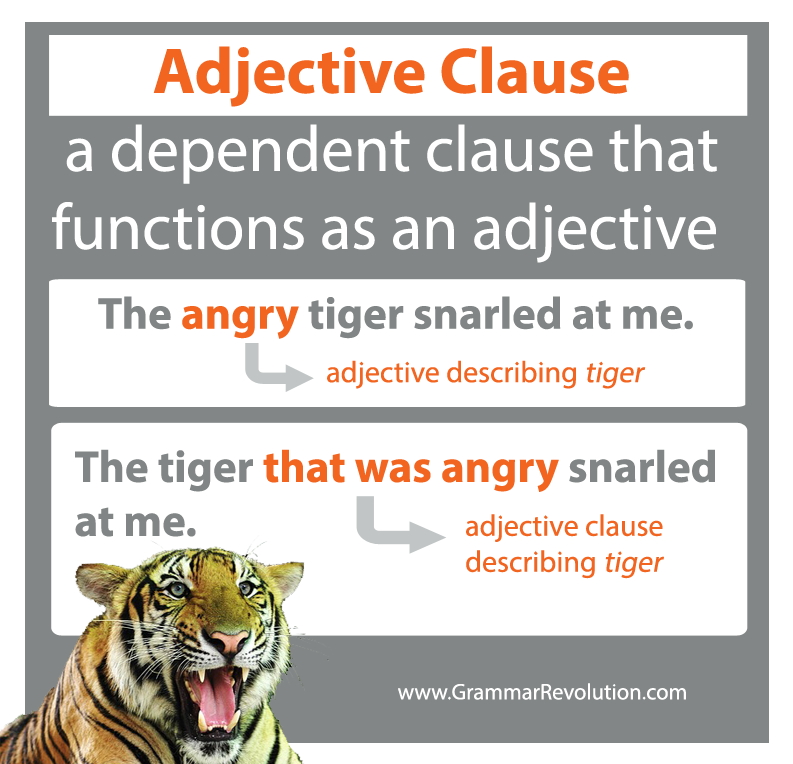 Adjective clauses (or relative clauses) are a type of subordinate clause that act as adjectives. The whole clause does the job of an adjective. Adjectives modify nouns and pronouns. Clauses are groups of words that contain both a subject and a verb. Subordinate clauses cannot stand alone. Take a look at this sentence. The happy woman danced across the street. Happy is a word. It is an adjective modifying the noun woman. It is telling us which woman. (Which one is an adjective question.) Which woman? The happy woman. Even if you don't know anything about diagramming sentences, it's easy to see in the following sentence diagram that the word happy is modifying the word woman - it's branching right off woman! Now, look at this sentence. The woman who looked happy danced across the street. This time, we have a whole clause doing the job of an adjective! The whole clause who looked happy is modifying the noun woman. It contains a subject (who) and a verb (looked), and it is answering the adjective question which one. Which woman? The woman who looked happy. The whole clause is acting as one part of speech - an adjective. Because of this, we call it an adjective clause. Now take a look at the diagram of this sentence. You can see that who looked happy is modifying the noun woman. It looks a bit different from the diagram above, but just like with the adjective happy, the clause who looked happy is branching off woman. Here's a picture to summarize what we've covered so far. Most of the time, relative clauses are introduced by certain words called relative pronouns. The cool thing about relative pronouns is that they also act as the subject, object, or some kind of modifier within the adjective clause. Let's use this sentence as an example. The independent clause is This is the house. The relative clause is that Jack built. Notice that both clauses have a subject and a verb. That is introducing the relative clause. It is linking the word house with the whole clause. That is also acting as the direct object within the clause. Look at the sentence diagram, and it will help you see what I mean. 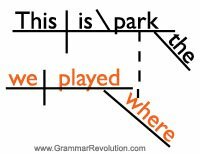 You'll find more information and sentence diagrams on the relative pronouns page. Sometimes the relative pronoun is missing from the relative clause. Don't fret! You can still have an adjective clause without the relative pronoun. Here is an example of a sentence with the relative pronoun that. The instrument that I love is the piano. The adjective clause is that I love. Can you think of how you could express that same idea without the relative pronoun? The instrument I love is the piano. The instrument (that) I love is the piano. Whenever words are implied in a sentence, it is called an elliptical. The technical name for a missing relative pronoun is an elliptical relative pronoun. If you want to diagram the sentence, diagram the implied relative pronoun in parentheses. While most of the time relative clauses are introduced by relative pronouns, sometimes they are introduced by relative adverbs (where, when, why). Here are some examples. Notice that the clause is still modifying a noun. This is the park where we played. Tuesday is the day when we have pizza for dinner. Our teacher told us the reason why we study grammar. Psst! 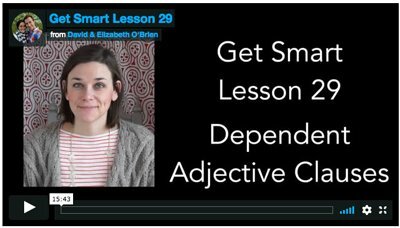 Learn more about adjective clauses with this sample lesson from our Get Smart Grammar Program. I hope this lesson helped you learn about relative clauses! You're so smart! If you want to test your skills, check out the page on diagramming relative pronouns.